I sent out my first post this morning around 5 AM about the breaking news of Verizon and Google having a conference call to discuss a partnership with Android – Google’s mobile phone operating system. Then later in the day, prior to the 10AM conference call, I did an update to the story that said an agreement has been solidified between Google and Verizon. And then again, a couple a hours later I wrote again about how word came out that Verizon would have 2 phones with Android OS on the market by the end of the year. 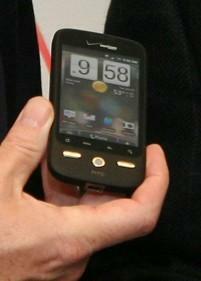 Finally, at 5:21PM, after a long day of tracking the story, we’ve got a photo of the Verizon / Android phone. And it appears to be a version of the HTC Hero – at least that what it appears to be from the Verizon Wireless’s press Web site.